Charcoal, 100% cotton, short-sleeved t-shirt featuring a band image on the front with the 2009 European 360 Tour dates on back. 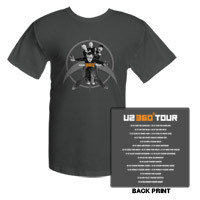 Black, 100% cotton, short-sleeved t-shirt featuring a band image on the front with the 'U2 360° European Tour dates on back. 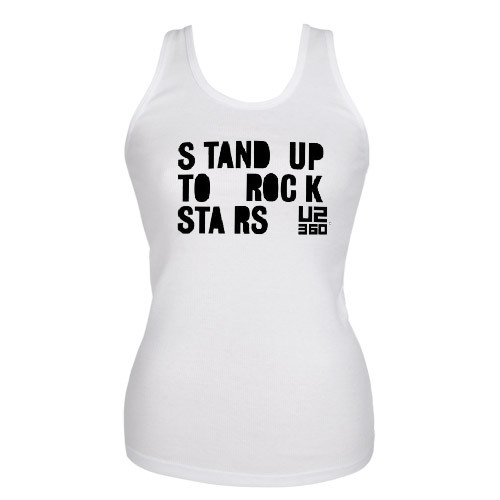 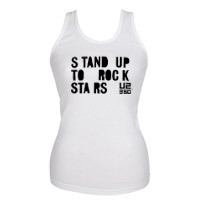 Women's, White, 100% cotton, tank top that reads 'Stand Up To Rock Stars U2 360' on the front. 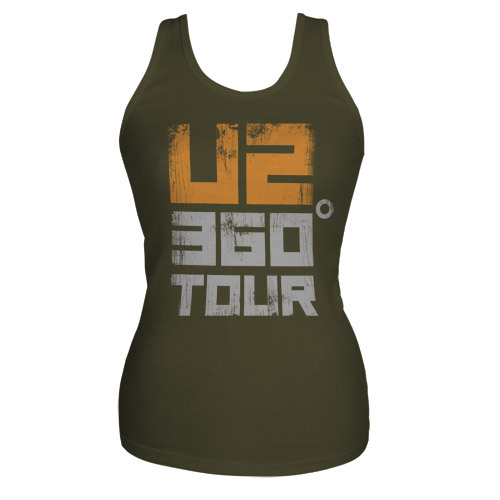 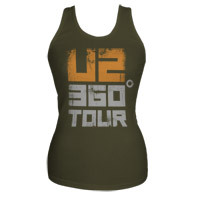 Women's, Green, 100% cotton, tank top that reads 'U2 360° Tour' on the front. 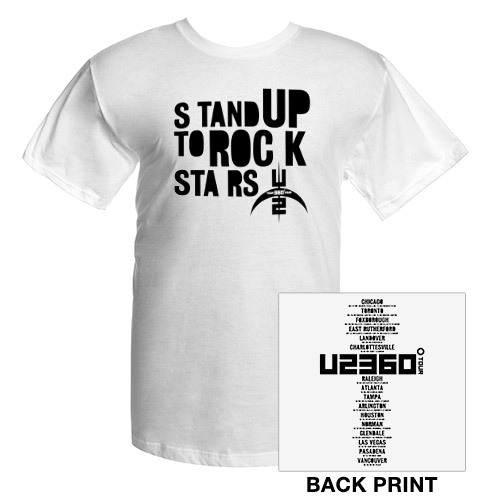 White, 100% cotton, short-sleeved t-shirt that reads 'Stand Up To Rock Stars on the front with the 2009 US 360° dates on the back. 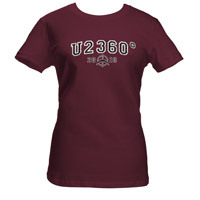 Women's, Burgundy, 100% cotton, t-shirt that reads 'U2 U2360 2010' across the front chest. 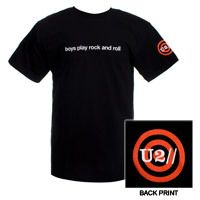 Black 100% cotton shirt featuring Boys Play Rock and Roll on the front and the Target logo on the left sleeve. 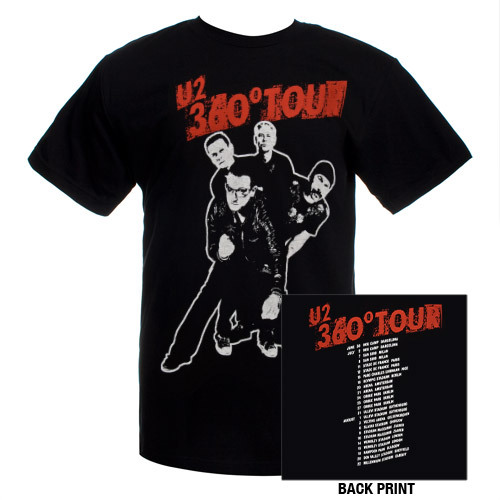 Available only on U2.com. Navy 100% cotton shirt featuring Hello Hello on the front and the Vertigo logo on the left sleeve. Available only on U2.com. Olive green 100% cotton shirt featuring "unos//dos//tres//catorce//" on the front and the Vertigo logo on the back. Available only on U2.com.